Choose your Nordic Adventures in the Village of Radium Hot Springs and surrounding areas, from the cross-country trails in and around the community, including Nipika Mountain Resort for your groomed nordic adventures, Kootenay National Park, the Springs and Radium Courses for the ungroomed and self-guided adventures. Stay in Radium and choose your Nordic Adventures! Nipika Mountain Resort is located 30 minutes outside of Radium Hot Springs, 14km down Settlers Road just bordering Kootenay National Park. This hidden gem is home to 50km of groomed classic and skate ski trails as well as separate groomed fat bike and snowshoe trails. There are trails for every ski ability and every winter activity. All trails are pet friendly, bring your furry friend for a ski. On site wax room, rental shop, heated day lodge, and lunch area. Lessons are also available daily. Kootenay National Park, located just outside the Village of Radium Hot Springs, offers self-guided snowshoeing or cross country skiing around Dog Lake or Cobb Lake. These trails are not maintained and are not patrolled but are to be enjoined by all and used at your own risk. The Toby Creek Nordic Ski Club is proud to promote and maintain the Lake Windermere Whiteway. 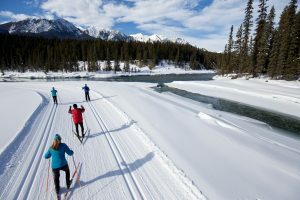 The Whiteway is a 31 km groomed track of Nordic Adventures that run all the way around Lake Windermere and connects the towns of Invermere and Windermere. The Whiteway has tracks for classic cross-country skiers, a groomed skate skiing track, and a cleared ice-skating track. 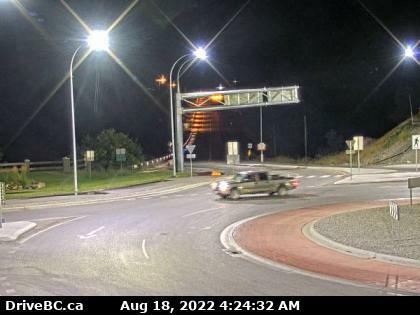 There are three official entry points onto the Whiteway; one at Kinsmen beach in Invermere, one at the Invermere Bay Condos in Invermere, and one at Windermere beach. Each entry point has a large timber frame sign which provides user information, maps, information about the local Nordic skiing club, and a donation box. 20 km of groomed trails follow the Toby Creek trail system at Panorama Mountain Resort for even more Nordic Adventures! Click Here for your printable trail map! The Panorama Nordic Centre, located in the lower village (access from the lower parking lot), or across the suspension bridge from the Village Gondola. Offering more than 20 km of groomed trails for classic and skate skiing. The trails take skiers along the scenic Toby Creek. Different routes are available for all levels of skiers from beginners to advanced. Guest can travel a 12 km loop out to the Hale Hut Warming Cabin for an unforgettable afternoon in the mountains with spectacular views. Nordic Adventures await on the Lake Lillian Whiteway, located just 10 minutes outside of Invermere. 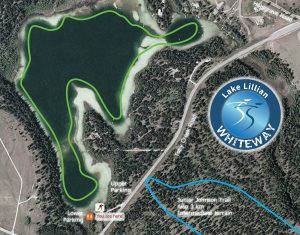 A gorgeous lake-based 3km classic and skating skiing trail. $5 day use fee payable online here or in the cash box on the welcome sign. The Lake Lillian Whiteway is also maintained by the Toby Creek Nordic Club. The Toby Creek Nordic Ski Club is a registered non-profit organization and at over 300 members, now boasts one of the largest sporting and recreation organizations in the Columbia Valley. The goal of the club is to provide healthy winter recreation opportunities for families in the Columbia Valley. Offering youth programs for kids ages 3 to 13 years old, adult learn to ski programs, classic and skate ski clinics as well as a Ski S’Kool program for grade 3 classes in the area. There are 6 km of cross-country trails located at the Fairmont Hot Springs Ski Area, for your nordic adventures pleasure. Please remember to bring your Nordic skis with you, these rentals are not available at the resort.